Amid the recent controversies surrounding Uber related to its questionable ethics, threats to run “oppo” research on critical journalists, and customer privacy violations, competitor Lyft announced it was having its best week ever. The implication is that Uber customers switched their allegiance in light of Uber’s scandals. But of course Lyft would say this – the two are fierce rivals, after all. However, as it turns out, Lyft’s app usage data confirms that it did see a spike. But whether that spike came at Uber’s expense is not as clear. As Uber’s PR disaster unfolded, a social media campaign branded #deleteuber saw a number of Uber customers publicly touting how they were removing the app from their phones for several of the above reasons. Some users also expressed sentiments about Uber’s lack of a moral compass, or in valuing money over ethics and user privacy. The company has since responded by hiring a data privacy expert and legal aid to analyze its business practices and has made public statements assuring customers it keeps their data private. Meanwhile, in the week following Uber’s scandals, Lyft said it saw the most rides ever. We checked with a couple of companies (unassociated with Lyft or Uber) who have visibility into mobile app usage data. One firm, SimilarWeb, which just raised $15 million more in funding to expand its mobile app insights business, says its data aligns with what Lyft is saying. The week following the BuzzFeed post that kicked off the scandals and subsequent PR meltdown, Lyft saw a rise in app usage that spiked at 71 percent higher than average for Usage Time and a 67 percent spike in daily sessions. Additionally, another firm with access to app usage data, Mobidia, also confirmed it was seeing the same thing. To be clear, these companies aren’t talking about movement in the app stores’ charts, which is largely driven by downloads, but rather actual app usage. Mobidia provided the following chart demonstrating Lyft’s rise (below). However, that rise didn’t exactly coincide with a significant decline on Uber’s side, from the looks of things. With the BuzzFeed article hitting on Nov. 17th, one would expect to see Uber’s usage data flatline or drop if people were really moving in droves to Lyft from Uber. But Uber’s line is still pointing up. 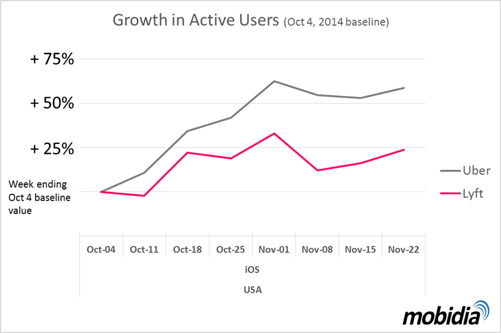 And again, that’s active user growth – both companies are still growing their install bases rapidly, the chart shows. Mobidia tells us Uber did not see decline in usage. “Both Uber and Lyft experienced an uptick in usage, however, Lyft did show a sharper curve.” A newer graph (below) illustrates this further, showing user-base metrics for both companies. “Uber is crushing it relative to Lyft. Even if Lyft grew quick that one week – they have a long way to go,” Mobidia’s spokesperson explains. Meanwhile, app download data from App Annie doesn’t show much in terms of massive drops or rises for either company, each which historically have active charts showing regular peaks and valleys related to a number of other factors beyond just consumer sentiment. Uber, though, does show a slight decline in recent days, occasionally falling out of the top 50 Overall apps on iTunes, for example, where it’s often ranked in the top 25 Overall. (Data from App Annie/iTunes App Store). As VentureBeat also recently pointed out, the impact to Uber has been more around public perception, not its actual business. The media has had a field day with Uber, and some consumers responded by trashing the app’s ratings, but its downloads continued normally. The truth is that consumers don’t often choose a business to support based on their feelings about its ethics. Outside of the luxury market, consumers tend to vote based on price and convenience. Look at top retailers like Walmart and Amazon, which have both come under fire for worker abuses in the past, for example. Or look at Chick Fil A which weathered a massive storm of negative consumer sentiment after its CEO made homophobic remarks related to gay marriage. The media backlash was thick and, yet, the restaurant continued to rapidly grow and has even now surpassed competitor KFC. Or look at Facebook, which was regularly the subject of media scolding as it shifted its privacy policies under users’ feet. It’s still the most massive social network in the world, with 1.35 billion active users. In addition to the sad reality that consumers can’t seemingly impact the ethics of bigger companies, Uber itself remains a force to be reckoned with. It’s not afraid to bleed cash as it expands to pick up share in emerging markets which means that while it may be losing some of its more righteous install base, it’s adding ever more new users who have yet to be offended enough to quit. Correction: the last Mobidia chart had the lines mislabeled. The data was accurate, however, and this has since been updated.